…of epic proportion. Yup, I got broadsided by an impromptu and inexcusably long hiatus. And usually, when a blogger has been absent for as long as I have, they have the good manners to have gone through, done some house-keeping and renovated the entire shebang, but not me, no sirree! The fact is, I lost my writing mojo, and I’m not even sure if I’ll ever get it back. We’ll see. I have a lot on my plate this upcoming year, so it’s not like I won’t have anything to write about. I’m just a little lacking in the time and dislazya departments. One of my problems is that I have all these wonderful ideas for knit designs…some of them even using Dizzy Blonde Studios yarn. Unfortunately, I don’t have enough hours in the day, arms on my bodies, hands on my arms, or brain cells, to accomplish it all in what I consider a timely manner…which is to say…I want it done YESTERDAY! Thank goodness that there are others picking up the slack, and some amazing patterns are beginning to surface, using DBS yarns. Here are 2 of my favorites. 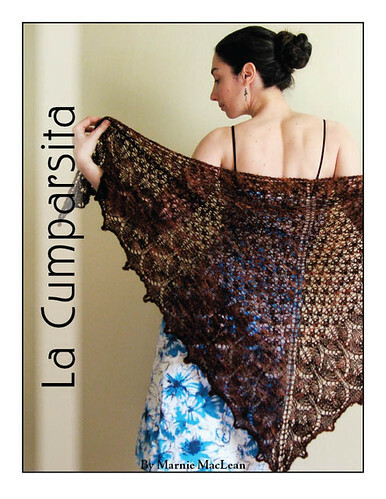 La Cumparsita is a wonderfully designed shawl by Marnie MacLean. Yes, THAT Marnie MacLean…the Marnie of Marnie, speak! and Twist Collective fame. La Cumparsita uses just 1 skein of DBS, Dizzy Blonde Superwash Sock! Even thought the finished product is deceptively intricate thing of beauty, the pattern is written so well that it’s relatively simple to follow. 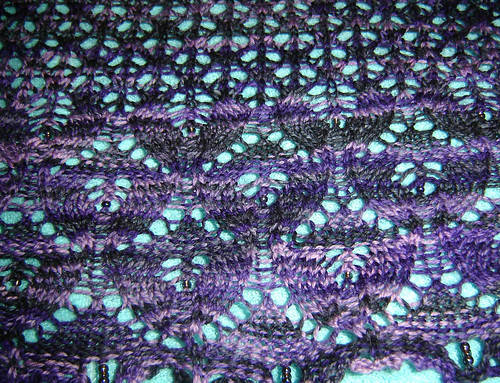 I knitted my first one in Veronica/Lac Noir and added some beading in the “eyes” of the oriel lace. Some day, I’ll do a second one, probably in Scarlett/Tragic Cherry, beading that one as well. I highly recommend checking gauge on this pattern. I didn’t, and ended up with something a little smaller than I would have liked. For the next one, I’ll go up a needle size or 2. This pattern is available on both Marnie’s website (linked above) or on Ravelry. I cannot recommend it enough! The second design was released at the end of 2008, but I don’t know if I ever showcased it here, and it’s well worth it. These are the first pair mitts/gloves/mittens/wristers I have ever knit. Actually, to date, they are the ONLY pair I have ever knit. Again, I was astonished with how easy a knit they really were, which can only be attributed to the ingenuity of the designer. Also? You could probably get 2 pairs of Mo Autumn Mitts out of a single skein of Dizzy Blonde Studios Superwash Sock. Celia knit hers out of the Woecake colorway, which is an infinitely better yarn choice than mine for showing off the pretty lace panels going up the back of the hand. I knit mine in a custom-dyed colorway I call “Momoze”…a tribute to my little 4-legged, bewhiskered, bottle-cap-batting companion who is no longer with me. This way, whenever I wear them (and I still do, and quite often especially this winter), I keep his memory immediately at hand. If you’re looking for a quick, simple, beautiful knit, I highly recommend Missouri Autumn Mitts. Celia-Anne blogs too: CeliaAnne Knits. You can find this and all her other patterns at Art Fire, Etsy or on Ravelry. Tenderfoot is just about to be published. I found a major engineering error in the pattern, and it’s taken me a while to work it out. Prototype has been reknit, the pattern is completed, along with charts and photos with my new official Dizzy Blonde Studios model, all that’s required is about a 30-45 minutes of uninterrupted, non-dumb-question-of-the-day-answering, silence in which I can concentrate on uploading the pattern, writing copy and then creating the button and all the links necessary to get this pattern self-published and done…so probably next year. (I kid…I kid). Actually, probably next week. So, the first ever Mean Girls Yarn Club year is coming to a close. Our members are receiving their awesome February installment as I type. It sounds like my partner in meanitude, Bobbie, of House of Awesome, with dyeing assistance from Anne, the talent behind Alpha B Yarn did a smash-up job this month. Hopefully I’ll be able to judge for myself once I get home. Hell, I may even blow off the gym for this. We have one more installment going out in April, and the Mean Girls Yarn Club, virgin run will have come to a close. But fret now, my fellow meanies, I’m happy to announce that sign-ups will begin in May for Mean Girls Yarn Club, Part Deux! The theme and Mean Girls have already been chosen, indy vendors have been contacted, and I’m brushing up on my nom-making skills! Again, membership will be limited to 50-ish members, and again we have 2 payment options. Also, I’ve have decided to have a booth at 2 fiber festivals this year: Estes Park Wool Market, in Estes Park Colorado, June 10-13 and Southeastern Animal Fiber Fair, aka SAFF, October 22-24. Yes, because I have so much spare time, that I’m not stressing over dyeing up enough stock for these events. Nope, not one bit. GAAAAAAAAH! Pretty, pretty patterns! 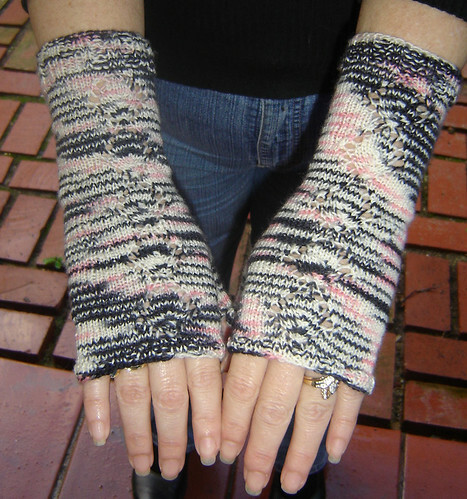 I was just saying today that I need some more mitts to wear in my freezing cold office; I think these would be perfect. Mean Girls Part Deux – YAY! I’m serious about the mitts. They knit up wicked-quick! oh my freakin….that’s a BEAUTIFUL shawl!!! A couple of my friends lives in the Estes area. I will have to send them your way for the festival!